The Fire King Hadhuul (or Hadhuul the Fire King) was an Ayleid leader who ruled before and during the Alessian Slave Rebellion. He is remembered as a particularly cruel slave master; tales from his realm say the slaves were subjected to tormenting drugs, and children were set aflame for nighttime tiger sport. Shortly before the fall of the White-Gold Tower in 1E 243, he was slain by Pelinal Whitestrake on the granite steps of Ceya-Tar (later called Ceyatatar), in the Great Forest of Cyrodiil. It was his first, and last, defeat. In 2E 582, Hadhuul's spirit returned to the ruins of Ceyatatar, along with bound Flame Atronachs and the ghosts of his army. The Atronachs posed a threat to the nearby town of Vlastarus, although the Fire King was banished before he could cause any harm. Jarl of Falkreath in the Second Era. He was young when he inherited the crumbling hold after the Orc chief Yashnag slew his father in battle. In a ritual trial by combat, he challenged Yashnag and his champions and defeated them in turn, eradicating the Orc chiefdom of Western Falkreath in 2E 467. An infamous pirate king also known as "The King of Ghosts" who terrorized the northern coasts of Tamriel. He supposedly had an unnaturally long lifespan, although it is unknown to historians how much of the ancient "Haknir Saga" is true. He was said to be a fearless fighter who enjoyed torture and murder for its own sake, and that he had a great wound upon his face which never healed - his eponymous Deathbrand, thought to have been a term in some unknown agreement with Mehrunes Dagon. When he was finally at death's door as an old man, he purportedly placed a curse upon his treasure, including his Stalhrim armor, and had it buried on a rocky shoal off the northern coast of Solstheim. He also ordered his boats destroyed, as he did not believe any of his crew were fit to replace him. He then sealed himself inside the ruins of Gyldenhul Barrow along with his treasure. Hakon One-Eye was a Nord hero and Tongue in the Merethic Era. Hakon, Felldir the Old, and Gormlaith Golden-Hilt were the leaders of the rebellion against Alduin. They were among the first mortals to learn how to wield the thu'um, apart from the Dragon Priests. During the Dragon War, Hakon sought the help of Miraak, the First Dragonborn, in defeating Alduin, but Miraak refused to help. Undeterred, Hakon and his companions fought against Alduin atop the Throat of the World. Finding that they had no means to achieve a final victory, the companions successfully sent the wyrm forward through time using an Elder Scroll. In the Fourth Era, when the Last Dragonborn entered the realm of Sovngarde to defeat Alduin, the spirits of Hakon and his compatriots joined the fray in the final battle against their nemesis. King of Skyrim almost a thousand years after the publication of the Alessian Doctrines. King Hale introduced four of the Daedric Princes to the written record in one of his tractates when he wrote that the wickedness of his political enemies was comparable to the depravity of Sanguine, the cruelty of Boethiah, the calculations of Molag Bal, and the madness of Sheogorath. Hannibal Traven was the Arch-Mage of the Mages Guild at the end of the Third Era. He was a staunch opponent of necromancy and was responsible for several poorly-implemented guild reforms. Originally, Professor Traven was the head of the Anvil Mages Guild, and supposedly ran a "clean hall". He was promoted to the position of Arch-Mage circa 3E 431. Among his controversial reforms were a tightening on admission to the Arcane University and an outright ban on the practice of necromancy by guild mages. Traven's divisive stance on necromancy had many strong supporters even outside the guild, although it caused a large degree of internal fracturing. Half the Council of Mages resigned, and Magister Ulliceta gra-Kogg of Orsinium was forced to flee following her attempted arrest by the Knights of the Lamp for practicing necromancy. Traven would go on to publish The Black Arts On Trial, to document the debate between gra-Kogg and Magister Voth Karlyss of Corinth. In 3E 433, coinciding with Traven's policy change, Mannimarco returned to the affairs of mortals. With necromancers now shunned from the Mages Guild, many flocked to join the Order of the Black Worm. Mannimarco's followers were soon openly attacking the guild, going so far as to burn down the Bruma guildhall. As Traven struggled to control the Council of Mages, he turned to the Champion of Cyrodiil for help in investigating and delaying Mannimarco's plans. Traven had the Champion secure both the Necromancer's Amulet and the Bloodworm Helm, as well as a unique colossal black soul gem the necromancers had created. In a final effort to save the guild, Traven sacrificed himself by trapping his soul within the colossal gem to allow the Champion to confront Mannimarco. With the filled gem, the Champion was shielded from Mannimarco's powerful magic and was able to defeat him in Echo Cave. Traven's final act as Arch-Mage was to appoint the Champion as his successor. Although Traven's sacrifice saved the Mages Guild from destruction at the hands of the Order of the Black Worm, the institute was not able to survive the strong anti-magic sentiment that arose in the early Fourth Era following the Oblivion Crisis. The Synod and the College of Whispers formed following the guild's dissolution. Given that Traven was soul trapped, it is likely that his soul was sent to the Soul Cairn in death. Before his defeat, Mannimarco revealed that he had planned to reanimate Traven as a Worm Thrall for study. Hanse was jarl of Winterhold sometime during the First Era. According to Imperial scholars, he was the obvious and capable choice to become the next High King of Skyrim after King Borgas was killed in 1E 369. The moot's failure to appoint him High King ultimately ignited the War of Succession, which didn't conclude until 1E 420. During his reign, he wore the Helm of Winterhold. High King Harald, also known as Harald Hand-Free, was the 13th in the line of Ysgramor at the dawn of recorded history, and he's considered the first historical Nord ruler. During his reign, which started in 1E 143, the Elves were finally driven from the present boundaries of Skyrim (at least, driven from most of the inhabited surface, as Dwemer and Falmer remained underground). Harald is remembered for being the first king to relinquish all holdings in Atmora and properly found Skyrim as an independent nation with Windhelm as its capital. In 1E 139 and 140, the forces of "Lord Harald" also found, besieged, and eradicated the last known bastion of the Dragon Cult in Skyrim. The Jagged Crown dates back to the reign of Harald, if not before. The Moot was also first formed under his reign, and Skyrim apparently made many advances in record-keeping and scholarship. He is also remembered for defeating the treacherous sons of Archmage Gauldur with the help of Archmage Geirmund and a company of battlemages. The Gauldur legend was so dangerous that Harald instigated an age-long attempt to erase them from history, though this ultimately proved unsuccessful. Harald had an unusually long reign of 78 years (for a Nord) and outlived all but three of his sons: the eldest Hjalmer (who died soon after), Vrage (who carried on his father's campaign of expansion), and Olmgerd the Outlaw (an illegitimate son who fought and died in Morrowind). A Nord Vampire Lord and creator of the Volkihar vampire bloodline. Harkon was a very rich ruler of the lands, but feared mortality. He made a pact with Molag Bal and sacrificed a thousand innocents to the Prince so he and his family could become vampires. Hidden for many eras in Castle Volkihar, Harkon plotted to blot out the sun so vampires could rule Tamriel. His wife Valerica tried to deny him this ritual by going into hiding with an Elder Scroll and sealing their daughter Serana away in a crypt. The Dovahkiin, armed with Auriel's Bow and with the help of Harkon's estranged daughter Serana, fought Harkon within his castle and slew him. Haskill is the Chamberlain of Lord Sheogorath, "the one constant in the ever-changing whims of the Madgod". He often takes on the appearance of an elderly man in a melancholy yet flamboyant suit. Just like his colleague Dyus, former Chamberlain of Jyggalag, his exact origins are unknown; but he is known to have once been a mortal who mantled Sheogorath, becoming a Vestige. According to him, however, he has been under the service of Sheogorath since the "beginning". He took care of all of the more administrative and mundane duties involved in running the Shivering Isles. Despite having once been mortal, he has no desire to visit Tamriel. He has a strong dislike of Mehrunes Dagon, and finds mortals to be irritating. In 3E 433, Haskill helped Sheogorath's Champion in his many endeavors, and eventually helped him stop the Greymarch and free Jyggalag/Sheogorath of his curse. Haskill serves the Champion as the new Madgod, and has been known to substitute the new Sheograth when summoned to Mundus. Vicecanon Heita-Meen was an Argonian ex-slave who served as a vicecanon in Stormhold during the time of the Ebonheart Pact. She is largely responsible for the Argonians' entry into the Pact. Heita-Meen was born during the mid-Second Era and raised as a house-slave, receiving little education. Her master was Councilman Glathis Dres of House Dres, known for his cruelty even by Dres standards. She worked on a saltrice plantation in Thorn. Circa 2E 572, after being beaten unconscious for seating the guests at a banquet out of order, she planned an escape with her fellow slaves. They fled into the Thornmarsh, and stumbled into a troop of treacherous Argonians from the Archein tribe, who were employed by the Dres. It was while she was held captive in the Archein village that Heita-Meen received a vision from the Hist, who wanted her to defend the Nords and Dunmer in battle. The Archeins escorted them back to Thorn, which was nearly empty of Dunmer following Almalexia's call to arms to defend Morrowind against the Second Akaviri Invasion. Seeing this, Heita-Meen strangled Glathis with his own whip, and swiftly challenged the centurion of the Archein guards for her position by right-of-combat. After killing the centurion and gaining command of the Archeins, Heita-Meen marched on Stormhold, intending to do the same there. Instead, the troop encountered Walks-in-Ash, who was able to convince Stormhold's Shellbacks to join without bloodshed. The army then marched on Stonefalls in Morrowind to fight the Akaviri. They arrived at the final battle near Ebonheart and helped to push the invaders into the sea. The Argonians' participation in the battle helped contribute to the signing of the Ebonheart Pact between Eastern Skyrim, Morrowind, and Black Marsh. Heita-Meen was released from slavery and appointed as the Argonian vicecanon of Stormhold, where she shared power with the Nord Vicecanon Hrondar and the Dunmer Vicecanon Servyna. Guided by the Hist, Heita-Meen's actions had allowed the Argonians to preserve their culture and reclaim their lands under the Pact. In 2E 582, Vicecanon Hrondar was assassinated by the Aldmeri Dominion, who replaced him with a skin-stealer in preparation for a full invasion of Shadowfen. The Dominion then began murdering Stormhold citizens for use by the skin-stealers, targeting only Dunmer in order to shift the blame onto disgruntled former slaves or Shadowscale assassins. Eventually the Dominion's actions came to light, and Heita-Meen journeyed with the other vicecanons to the ruins of Ten-Maur-Wolk, where they became trapped by Dominion forces. The Pact successfully defeated the invaders at the Battle of Ten-Maur-Wolk, and Hrondar was revealed to be an imposter. Along with Servyna, Heita-Meen travelled throughout Shadowfen in an attempt to disrupt the invasion's sinister intentions: to destroy the Argonians' connection to the Hist, resulting in the theoretical extinction of the race. Along with the Soulless One, Heita-Meen entered the Dominion-occupied ruins of Loriasel, which housed the Mnemic Egg. After defeating the invasion's mastermind, an Altmer alchemist named Ruuvitar, Heita-Meen approached the Egg and became trapped in a vision of the Hist, whose collective consciousness had been partially corrupted by the Dominion. The Soulless One entered into the same vision and saved the Hist, rescuing Heita-Meen from her trance. Following the Dominion's defeat, she transported the Mnemic Egg to Windhelm for safe storage, and attended the Konunleikar festival thrown in High King Jorunn's honor. The Egg was later pledged to the Pact at a Great Moot at Skuldafn, as a representation of the Argonian people's commitment to the alliance. Heita-Meen is the author of From Argonian to Saxhleel. According to the popular historical fiction The Wolf Queen, she was the (first) Cyrodiil Queen of Lilmoth (the previous Argonian priest-king having been executed), Wife of Magnus Septim, and mother of Pelagius Septim III. She represented Imperial interests in Black Marsh admirably as the Cyrodilic ruler of an Argonian kingdom, and she knew how to recognize and confront adversity. Empress Hestra ruled in Tamriel during the First Era, circa 1E 1029. That year, she expanded the Alessian Empire, admitting High Rock as a province after she defeated King Styriche, the Vampire of Verkarth with the aid of the Bangkorai Garrison. When the Empress Hestra led her legions in harrying the Vampire King and his Gray Host into western Hammerfell, it's said she did so while riding a great Flame Atronach Bear Mount named Fiery Ursula. During her reign, pirates and brigands used the swampland of Black Marsh as a base for launching attacks on merchants off the southeastern coast of Tamriel. She instigated an aggressive anti-piracy campaign in 1E 1033 that eventually led to the capture of the most infamous pirate, "Red" Bramman. Around the same time as the anti-piracy campaign, Hestra's forces worked to bring the Reach under their heel. While many of the various kings in the region surrendered, rebel holdouts still inflicted heavy losses. Hestra is also known to have improved the road system of her empire, an endeavor continued by the Reman emperors in later centuries. A powerful class of runestone was apparently named after the empress: "Hestra" stones are found in Cyrodiil, and grant the person who activates them a piece of armor and a weapon for a short period of time. Notably, another series of stones are named after Emperor Reman. One theory for the origin of these stones is that they were devised and placed by the rulers whose names they bear, while another posits that the stones were created much earlier and only moved into their current positions by the rulers. Ruler of Alinor in the Second Era. He was believed to be a direct descendant of the Divines who created Nirn. His rule is remembered as a long and great one, and he exemplified the best traditions of High Elven Ceremoniarchy, basing his every decision on the precedents laid down in the Scrolls of Praxis. In 2E 486, a small Maormeri fleet was sighted off the coast of his kingdom, and King Hidellith ordered his navy to give chase. They followed the fleet to Pyandonea, where all but one of the ships were destroyed. His child with Kinlady Tuinden was born on the 5th of Second Seed in 2E 555. Following the dictates of the Scrolls of Praxis, they named her Ayrenn, and held celebrations for fifty-five days. He had other children, as well, including his eldest son Prince Naemon. In 2E 573, he gathered with his family at the Crystal Tower to celebrate what was supposed to be Ayrenn's entry for schooling as a ruler, but his daughter disappeared. She would not return until after Hidellith's death in 2E 580. The "Last Emperor" of Yokuda. Upon rising to power, he began to persecute the Ansei, and eventually went to war with them for control of the empire. The War of the Singers pitted the united Ansei under Frandar Hunding against Hira's armies, and after seven battles, the Ansei were victorious. They had been outnumbered thirty to one at the start of the battle, and twenty thousand Ansei remained standing by the end, suggesting that Hira's armies were composed of well over six hundred thousand troops. Over three hundred thousand people died at the final battle. How the Last Emperor met his end is unknown. Eldest son of High King Harald of Skyrim, he assumed the throne upon his father's death in 1E 221. He only ruled for about a year before dying, and his younger brother King Vrage the Gifted ascended to the throne. Hlaalu Helseth, a male Dunmer, was born to Queen Barenziah and Symmachus in 3E 376, and he is the older brother of Morgiah. Before the "Warp in the West", he spent most of his time blackmailing, bribing, and even killing nobles in attempts to expand Wayrest's influence. After failing to obtain the throne of Wayrest when his step-father King Eadwyre died, he returned to Mournhold in Morrowind with his mother. Once there, he joined the court of his uncle, King Athyn Llethan. After a relatively short period of time, Talen Vandas, Llethan's chosen heir, died, followed soon after by the King himself, leaving the throne of Morrowind to Helseth. This caused rumors that Helseth had poisoned them, a telling of events that the Queen Dowager, Ravani Llethan, backs up: she also knew of and appears to have been allied to a conspiracy, within House Hlaalu itself, against Helseth in favor of a candidate more acceptable to the House (evidently Helseth's status as being technically an outlander, not born in Morrowind itself - and a pro-Imperial outlander as well, sharing the sentiments of his father who had fought for the Empire against his own province - counted against him by comparison with a native Hlaalu of Morrowind, despite the fact that Helseth too is a member of the House, and indeed was the nephew of King Llethan). The Tribunal Temple also initially conspired against him, but were thrown into disarray by the fall of their living gods. 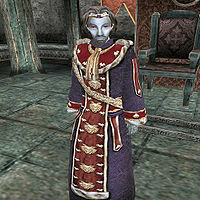 After becoming King, Helseth quickly started to cement his hold on power by using the Dark Brotherhood to assassinate a variety of targets, including attempting to kill the recently reborn Nerevarine, though according to Helseth this was a mistake - and one which backfired heavily, since the entire newly-formed Mournhold chapter of the Brotherhood was wiped out when the Nerevarine pursued the attacks back to their source. The truthfulness of Helseth's apology is suspect, as there was another attempt on the Nerevarine's life while guarding Queen Barenziah for the new King. Strangely, King Helseth tends to play up his habit of assassination, as he was one of the driving forces to publish A Game at Dinner, a book that accuses him of murder. In a shrewd political maneuver, King Helseth, representing his own House Hlaalu, formed an alliance with House Dres. Subsequently, he renounced the slave trade, setting the remaining Houses of Indoril and Redoran against him in a bloody civil war. Helseth emerged from the war battered, but without the loss of his essential powers, leaving the slave trade generally destroyed, and slavery without a foothold in all of Tamriel, although the practice persists in remote areas away from Mournhold. However, after the successive catastrophes of the Oblivion Crisis, the Red Year, the Argonian invasion and the break-up of the Empire which had backed him, at some point during the next 200 years House Hlaalu fell from prominence and Redoran became the new preeminent house. Neither Helseth nor Barenziah's fate after these calamities is known. A Nordic war chief and Tongue of the First Empire during the conquest of Morrowind. As his name suggests, he held particular animosity for elves. He attended the coronation of Emperor Gorieus in 1E 461, alongside his father and High King, Kjoric the White. Kjoric later rebelled against the Emperor, but was killed at the Battle of Sungard in 1E 477 or 478. Upon his death, the Moot named Hoag as High King. His reign was short-lived as Hoag died after mounting a last stand at the Battle of Glenumbria Moors in 1E 480 (or possibly 482; sources differ on when the battle took place). He was succeeded by Wulfharth of Atmora. The Dunmer remember him as "HOAGA, the Mouth of Mud", one of the great "demon chieftains" of the Nords who destroyed seventeen Chimer villages and two Dwemer strongholds. Holgeir was a Nord warlord. He fell in love with the huntress Fjori on the field of battle, where they fought until her sword broke his axe and his shield dulled her blade. With Fjori and Holgeir united, there came a time of peace for the clans of the forest. When Holgeir was bitten by a poisonous snake, Fjori journeyed to obtain a cure from the Akavir which instantly cured him. However, then Fjori too was bitten by a snake, and she died immediately due to exhaustion from her journey. Holgeir had a great tomb built, and after its completion, he took his own life, hoping to rejoin her in Sovngarde. Hrothmund the Red was a renowned Nord chieftain who lived in the early third century of the Third Era, though some claim he actually lived in the late Second Era. He was among those who left Skaal Village to found the Thirsk Mead Hall in Solstheim. After the founding, when the need for a leader became clear, he seemed the natural choice, but had to prove himself in a duel when he was challenged for the position. After using his axe to chop off his opponent's head, he displayed it on a pedestal in the Mead Hall, starting the tradition that survives in Thirsk to this day: the person who displays the greatest trophy on the pedestal in the Mead Hall would become the chieftain. Hrothmund's rule lasted 21 years, the second longest reign in Thirsk's known history by a year (and these long reigns are the exceptions; one chieftain survived for a mere three weeks). He was ultimately killed and eaten by Ondjage, the Fell Wolf, and whatever remained was buried in Hrothmund's Barrow, along with his axe and the Amulet of Infectious Charm. The 21st Count of House Branquette, Hurlburt led an army at the Battle of Granden Tor, ruling Shornhelm from 2E 522 until his death in 546. He was husband to Countess Iphilia of House Montclair and father to Prince Phylgeon as well as an illegitimate elder son, Prince Ranser, with a cousin of House Tamrith. Following Hurlburt's death, his sons both claimed his throne, and Ranser prevailed by citing a long-lost Direnni decree. Decades later, Ranser's death ended his war as well as the line of House Branquette, and in the absence of a monarch Rivenspire was reigned by the triumvirate Council of the North. Baron Wylon Montclair put forth a claim to the crown of Shornhelm, stating that as the son of Count Phylgeon, he was the only legitimate descendant of King Hurlburt and House Branquette. ^ Korir's dialogue in Skyrim. ^ A stone etching in Windhelm.